With an Introduction and Notes by Dr Andrew Frayn, Lecturer in Twentieth-Century Literature and Culture at Edinburgh Napier University. In these two compelling novels H.G. Wells imagines terrifying futures in which civilisation itself is threatened. 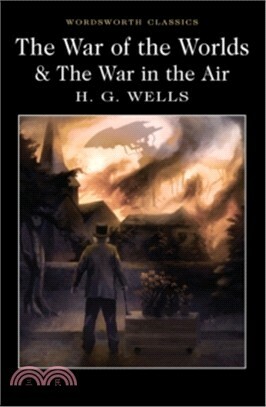 The narrator of The War of the Worlds is quick to discover that what appeared to be a falling star was, in fact, a metallic cylinder landing from Mars. Six million people begin to flee London in panic as tentacled invaders emerge and overpower the city. With their heat-ray, killing machines, black gas, and a taste for fresh human blood, is there anything that can be done to stop the Martians? In The War in the Air, naive but resourceful Bert Smallways is thrilled by speed and fascinated by the new flying machines. His curiosity sweeps him away by accident into a German plan to conquer America, beginning with the destruction of New York. The ease of movement in aerial warfare means that nothing and nobody is safe as Total War erupts, civilisation crumbles, and Bert's hopes of getting back to London to marry his love seem impossibly distant.